[EU] Dandy Lions Carnival presents: TPW- Tyrian Pro Wrestling! Forums » EU Events » [EU] Dandy Lions Carnival presents: TPW- Tyrian Pro Wrestling! I really enjoyed spectating this. Especially the dumbfounded looks when the wheelchair arrived from a different plane. I had to leave early so didn't see the end of the bout between the V's. Thank you for organisinng. Thanks for enjoying it! We do need to announce that last week accounting to more problems, we had to postpone the Royal Decree Match, as a result a special show will be held in just over 2 weeks on the 27th of June, starting at 7.30PM GMT. The show will start early, so don't delay to see a traditional Royal Rumble match! In 9 days from now TPW returns once again to Divnity's reach at our usual time of 7.30PM GMT, which for those who don't want to count is Wednesday the 27th of June! Expect some of our entrants to be announced over the coming days! An article from Chronomancy Times has been passed around, due to it containing exclusive TPW information. "I'll preface with the bad news, we're experiencing another week of delays" opened Mrs. Maywind. "We hate to disappoint our fans, but the undead from Elona having begun to appear around the world is a pressing matter some of our competitors must look in to first." This reporter assumed this was why the Dandy Lions carnival had been rescheduling so many press reports. "I will however discuss why I have entered into the Royal Decree Rumble match. Rumble matches are one of the most iconic special match types in wrestling history, where hearts of iron are shown, feats of strength and tenacity breed heroes and moments last a lifetime. As such it is my privilege to reveal myself as the first entrant." This reporter wonders if it was personal fame, or being the only one free for an interview in this time is why she revealed herself first. OOC: Yes. We're delaying another week. The patch reveal showing the patch intended release is a day before our new date, as well as the history of delays and issues around new patches has caused us to decide to defer by 1 more week to 4th of July. We once again apologise for all the delays and hope to see you soon. And more articles to come! Good evening ladies and gentlemen! Another quick update to remind you the show is in 8 days! I hope you're enjoying the patch If it isn't constantly crashing out for you, and another reminder. Please avoid spoilers for the living story during the event. We won't acknowledge the events to protect people from spoilers. Thanks. TPW team. One more update reminder. Now the patch has been working and the content is out, a reminder this is Wednesday at 7.30pm CEST! You also should refrain from any and all spoilers on the event day! Hope to see you there! With two days to go.. We caught up with a surprising figure who is entering. Mr. Matthew Moore Hardy, who claims to be the 'vessel' of an entity called 'Zenith' and several millennia old. Of course this reporter believes the man is mad. But entertained his discussion of his entry to the 'Rumble of Regal Decrees'. Upon asking about his arrival in TPW, he said: "I have entered this PLANE known as TYRIA due to my EXPEDITION of gold. You see I and my comperes BROTHER NERO and SAMMAEL have travelled far across SPACE AND TIME to PROCURE the golden championships of various planes." Upon being asked about his defeat to Cherry Coterill, he growled and gnashed his teeth at this reporter. He then stated "We do not discuss the setbacks of the GREAT WAR!". He then asked on his chances had this to say: "I will be VICTORIOUS on this plane like I have every other! I will make the evils of this world fade away and classify themselves as OBSOLETE!". He then added that he would 'Delete' the other competitors, then began to do an arm gesture and shouting 'DELETE' repeatedly. He then laughed in a peculiar means for a long period of time until this reporter chose to leave due to feeling uncomfortable. Yes, this is also a not so subtle reminder that TPW's Royal Decree rumble show is in just 2 days at 7.30 GMT in Divinity's Reach, behind the Ossan tavern. Reminder this event is in just under 3 hours from this post at 7.30GMT! Location is the same as last time! Shard info to follow 1 hour before! 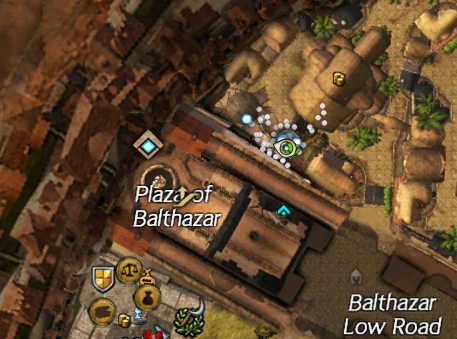 Tonight's shard for Divinity's Reach is 52.58.48.57:0! Please contact myself via TCGonBikes.6812 or Flippystuff.8532 for a taxi to the shard!